Want that extra spring in your step? After that, we’ll outline some key things to consider when buying, to help you pick the right tennis shoes for your specific needs. First, we’ll take a look at three of the best tennis shoes for men on the market at the moment. Adidas loves to make super-versatile tennis shoes. Their Barricade 2018 model is designed for use on any surface. The rubber outsole is very thick, meaning it won’t wear down easily on hard courts. However, it also has a decent tread, meaning it’ll keep you grounded on grass and clay. You also get a well-padded insole plus a thick layer of “Adiprene” material under the heel, which provides excellent shock absorption and comfort when running. The upper offers the best of both worlds. It’s well-padded and designed to flex with your foot, reducing your chances of developing blisters. At the same time, it’s surprisingly breathable, because Adidas have used their “Forgedmesh” material for extra ventilation. As a result, this is one of the most comfortable tennis shoes on the market right now. Due to the balance Adidas have been able to achieve between thickness and breathability, this is actually a pretty durable shoe. As we mentioned before, the outsole won’t wear down easily, and you’re unlikely to notice any seams splitting for a year or more, at the very least. It even offers excellent lateral support – the grippy sole works as a foundation to keep the shoe grounded when running. If you’re prone to ankle issues, the Barricade 2018 is an excellent pick. The only thing we can really fault these shoes for is their price: they’re a little expensive. However, you definitely get what you pay for. Slightly expensive, but definitely worth the money. A slightly cheaper option is the ASICS Gel-Dedicate 5. Like the Adidas Barricade 2018 we just looked at, this shoe is really well-cushioned. ASICS have included their patented “Gel” technology in the midsole, making this shoe super comfortable to wear, even if you’re playing on concrete. The upper is flexible, but provides good overall support. Considering how cheap they are, these shoes are surprisingly light. This allows you to change direction quicker, which can be the difference between winning and losing a crucial point. Plus, the Gel-Dedicate 5 is available in three different colorways – there’s something for everybody. Unfortunately, the mesh synthetic upper isn’t quite as breathable as what most other shoes offer. ASICS’ product can get pretty sweaty when playing in hot and humid conditions. Despite this, it’s still very comfortable to wear – just remember that it runs quite narrow. You may be better off looking at New Balance’s range if you’ve got wide feet. Overall, the Gel-Dedicate 5 is an excellent budget option. It has the comfort you need as a beginner, and durability to match. Super comfortable (runs narrow though). While Adidas focuses on durability and ASICS prioritizes comfort, Nike instead produces tennis shoes with performance in mind. The mesh upper on the Court Lite is reinforced with a synthetic composite for improved support. If you love to slide around like Novak Djokovic, these shoes will help to keep your ankles upright, even on clay surfaces. An added bonus of this firmness is how it makes the upper really durable – the toe area is even reinforced for abrasion resistance. Not only is the upper made primarily of mesh – the tongue is made of a knit material too. This is awesome for ventilation. Because warm air rises, the heat is able to come through the top of your shoe rather than being trapped in the toe area. As a result, you’ll feel cooler on the court, allowing you to focus on your shots rather than your shoes. Another performance-oriented feature of the Court Lite is the full length phylon midsole. Some companies inadvertently make their shoes slightly bottom-heavy by adding too much cushioning. Nike has avoided this, meaning that this shoe offers excellent shock absorption while also remaining super nimble. Considering what you get, these shoes are pretty reasonably priced. They come in an absolute ton of styles, and tend to last a really long time. N/A – excellent shoes for the money. In this part, we’ll review three of the best tennis shoes designed specifically for women. When shopping for tennis shoes, you aren’t limited to Adidas, Nike, New Balance and ASICS if you’re looking for something good-quality. Specialized tennis brands like Wilson and Babolat also have a fantastic range of sneakers. The great thing about their products is they’re designed specifically for tennis players – these manufacturers know just what you need to be at the top of your game. Wilson’s Rush Pro 2.5 comes with what the company calls an “Endofit” inner sleeve to keep your feet in place inside your shoe. This helps to prevent those annoying blisters, allowing you to focus on the match without worrying about painful rubbing. The inner lining is also designed to wick sweat – combined with the mesh upper and tongue, it helps to make these shoes super breathable. You also get an excellent all-surface outsole, which won’t wear down easily on concrete. The tread is long-lasting, and offers great lateral stability. Plus, Wilson have designed the internal footbed to be removable, meaning you can customize how the insole feels. You can leave it in for extra padding, or take it out to give your feet a little more room. This is a fairly expensive shoe. However, it’s definitely one of the best women’s options on the market at the moment in terms of overall quality. Well-designed outsole: durable, good traction. Comfortable – no internal slippage. Padded insole comes with a removable footbed. If you’re going to be playing tennis or standing on hard surfaces all day, it pays to have an extremely well-cushioned shoe. That’s why the Gel-Game 6 is a fantastic option for hardcourt tennis players, as well as nurses, chefs, pickleball players, and office workers (if your boss’ll let you wear them!). The Gel-Game 6 comes with ASICS’ patented “Gel” technology. This means that there’s a super-flexible layer of cushioning in the midsole, which makes it feel like you’re walking on gel. Because it’s so padded, you can keep playing (or working) for hours on end without discomfort. What’s more, these shoes are quite reasonably priced. They’re fairly sturdy, and should last for at least a year of intensive use. They also offer good support and great breathability due to the custom-engineered vents ASICS have included. However, the upper on the Gel-Game 6 is a little bit stiff compared to most other options. For beginner players and workers, this isn’t a big deal. 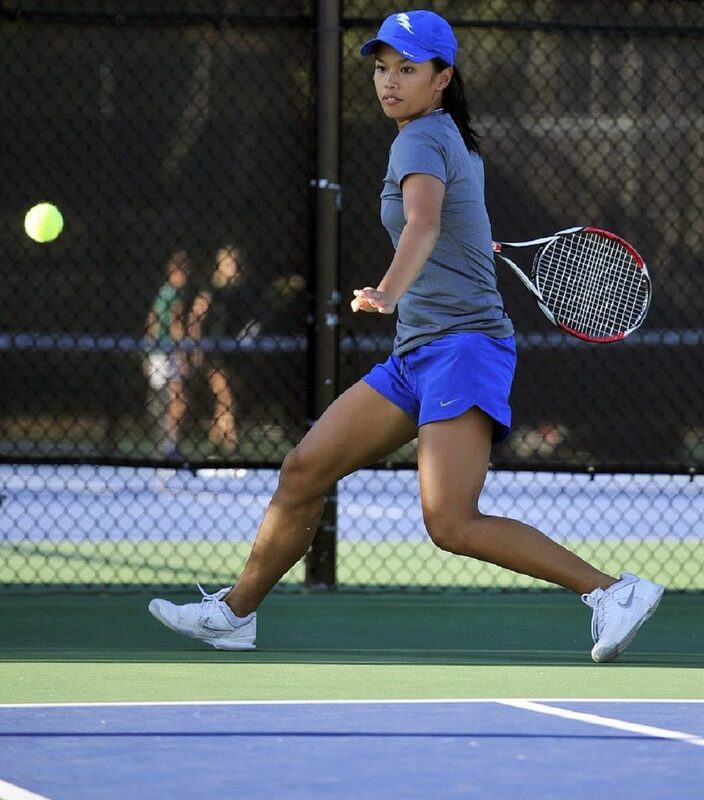 But for future tennis pros, you might want to look at something more flexible to get that extra edge on the court. Upper is a little bit stiff. Not a fan of shoes with heaps of flashy colors? This Adidas Originals model is one of the best-looking tennis shoes on the market right now. The breathable knit upper is available in white, grey and “ash pink”, and the tongue highlights offer a sophisticated contrast to these elegant primary colors. As you can see from the image, the outsole is super thick. This means a) it’s very comfortable to walk on and b) it won’t wear down easily. On some tennis shoes you’ll begin to see the front of the toe area come apart pretty quickly. But with this sneaker, the outsole and upper will last at least 10-12 months, even if you use them frequently. Rather than going for a gel/poly cushion, Adidas has used premium EVA foam in both the midsole and outsole. This stuff is not only super comfy, it’s also incredibly light. You can almost forget you’re wearing these sneakers in-game, which is exactly what you want in the middle of an intense match. There are two things you need to know about these shoes: firstly, they’re fairly expensive. In return for the higher price, you get stylish, comfortable shoes that are incredibly well-made. Secondly, they run big. Order a size down to ensure they fit nice and snug. Expensive, but they’re definitely worth it. As a nurse, you’ll need super durable shoes that are comfortable to wear during those 12+ hour shifts. You’ll also want something reasonably priced – unless you’re already on top of those pesky student loans! ASICS’ are widely regarded as the most comfortable brand of sneakers to wear for long periods of time, due to their patented “Gel” technology. This material makes for a cushioned footbed, which is still firm enough to support your foot. There’s decent lateral stability too, ensuring you don’t roll your ankle at the end of a tiring shift. With this model, ASICS have really gone above and beyond in the pursuit of comfort. As well as the gel inserts, they’ve included memory foam in the collar, which molds to the shape of your foot. This helps to create a personalized fit, supporting your heel without digging in. There’s also a molded sockliner, which achieves a nice balance between support and softness. It’s well-padded, but is still firm enough to keep your foot in place inside your shoe. The rubber outsole is nice and thick, and offers good traction, even on polished surfaces. A white colorway is available, but there’s also a pink and green style if that’s what you’d prefer. Considering how well this shoe performs for long periods of standing, it’s pretty reasonably priced. It’s fairly durable, although the forefoot outsole could be a little thicker – it might wear down on rough surfaces. Memory foam in the heel. Outsole could be thicker, but this won’t be a problem on polished floors. This is another all-white tennis shoe. However, unlike the Gel-Court Bella we just looked at, this Adidas shoe is a men’s option. The Approach is quite a cheap sneaker compared to the other shift worker’s tennis shoes we’ve looked at. So what’s the downside to paying a little less? For one, they’re a bit stiff. This can actually help to better support your ankle, but some people prefer to have a really flexible upper. If you’re not playing tennis or running in these shoes though, it’s not a super big deal. As you might expect, these shoes won’t last quite as long as a more expensive model. But again, if you’re working indoors rather than sprinting, jumping and landing in them, you should get at least a year or two out of these shoes before you need a new pair. The midsole is well-cushioned, and the upper is nicely ventilated, helping to keep you cool during intense shifts. For the price, this is a fairly comfortable shoe. Despite the synthetic leather (rather than mesh) upper, the Approach is actually pretty light. Its outsole has a good amount of tread, and won’t wear down easily. The toe guard is nice and wide, which helps to prevent the front of the shoe coming apart from general use. Good durability considering what it costs. Upper is a little stiff. The Air Monarch IV is Nike’s take on the reasonably-priced shift worker’s shoe. This particular model has been around for ages, which means that there are literally thousands of reviews from customers online. As a result, it’s much easier to tell what these shoes are good for. The consensus is this: the Air Monarch IV is incredibly comfortable, and feels great to wear. The air-sole compartment and phylon midsole offer excellent cushioning, so your feet won’t get sore even if you’re standing for hours at a time. They fit really nicely (even if you’ve got slightly wide feet), and the upper has good flexibility. For outdoor use, these shoes should last around 6-8 months. However, if you’re only going to be wearing them indoors, they should hold up for around 12-14 months, depending on how often you work. The first point of failure is most often the glue that adheres the front of the outsole to the toe area. When it splits, it’s time for a new pair. You can pay more for more durable shoes (check out our top picks for men and women). However, most of the time, paying twice as much won’t get you a shoe that’ll last twice as long. This is why so many people keep coming back and buying the Monarch IV instead of investing in a pair of $120-$150 tennis shoes. If you’ve got flat feet, you’ll want shoes with good midsole support to prevent overpronation. In this part, we’ll review the three best tennis shoes for athletes with flat feet. If you’re looking for shoes with excellent arch support, getting an ASICS or New Balance shoe is probably your best bet. The arch on this particular sneaker is nice and firm, because ASICS have included a compression material in the insole. Note that the women’s version of this shoe has a slightly softer footbed which is designed specifically for female athletes. The men’s shoe is by no means uncomfortable though: ASICS’ Gel cushioning system offers excellent shock absorption, even when playing on hard courts. Plus, the upper is made of a patented “Flexion Fit” material. This stuff is designed to offer excellent lateral support, while also having the flexibility to hug your foot and keep it in place inside your shoe. As a result, you won’t feel your arch slip off the midsole support piece as long as you get the right size. The Gel-Resolution 7 is also a super stylish option: it comes in a range of pretty nice-looking colorways. Although it’s fairly expensive, its durability makes up for it. You get a tough toe guard to protect the most vulnerable point on your shoe, and the rubber outsole is very thick. This shoe also has a neutral fit, meaning you should be able to use your own orthotics without too much modification. Overall, they’re an excellent option for those with flat feet. If you’ve got incredibly flat feet, these are the shoes for you. The footbed has excellent support, both laterally and for your arch. This means that you’ll be able to walk, run, and turn without internal slippage or ankle strains. To accommodate for this extra arch support, the midsole and outsole are both very thick. This is great, because it makes the MC806 super easy on your sole. There’s nothing worse than having the arch too firm – if it’s really hard it’ll dig in too much. That’s why New Balance have gone for a compression-molded insole which is not only super soft but also really durable. The rubber outsole is also incredibly tough. These shoes come with a toe protector to prolong the life of the shoe and prevent the front end splitting, which tends to be where most sneakers begin to fall apart. As such a well-engineered product, the MC806 is fairly expensive. It only comes in one style, which looks a bit like something you’d expect to see someone wearing in one of those cheesy before/after infomercial demonstrations. But if you need amazing arch support, who cares how you look? Thick midsole and outsole – comfortable. Good lateral support – hugs the foot. Can’t say they’re very stylish. This shoe is quite similar to the Gel-Resolution 7 we looked at earlier. Both shoes are priced pretty much the same, and come with ASICS’ foot-hugging flexion fit upper. They both have a thick toe protector and a tough outsole. However, the Gel-Solution Speed 3 has a slightly lower arch than the Gel-Resolution 7. This means that it’s a better option for people who have relatively flat feet, but don’t overpronate very much. If you’re just looking for a little bit of extra support but don’t want an arch that’ll dig in too much, this is an excellent pick. Plus, this sneaker is one of ASICS’ lightest ever tennis shoes. The company have installed a “SoLyte” insole, a material which is 50% lighter than EVA alternatives. It also makes for an extremely soft footbed, so this shoe is great for both hardcourt and softer surfaces like clay. We also reckon these shoes look a lot better than New Balance’s offering. You can get them in a massive range of colors – bright orange and yellow are available, but more neutral tones like grey and white are also on offer. Like most tennis shoes designed with arch support in mind, these shoes are on the expensive side. We can’t complain though – they’re lightweight, good-looking, comfortable, and offer great arch support without digging in too much. Lots of different styles on offer. Balanced arch support – not too hard, not too soft. Slightly pricey, but you get what you pay for. Now we’ll detail some tips to help you find the right pair of tennis shoes. This advice should help to clarify some of the things we talked about in our reviews. Upper: the entire area of the shoe that covers the foot (apart from the sole). This includes the area that protects your toes, heel, the top of your foot, and the sides of your foot. Outsole: the outer layer of the bottom of the shoe – the material that touches the ground (normally rubber). Insole: the inner lining on the bottom of your shoe – what your sole rests on. Midsole: a layer of cushioning material sandwiched in between the outsole and insole. Tongue: the piece of material in between your laces and the top of your foot. EVA/phylon: a type of ultra-lightweight foam typically found in tennis shoe midsoles. As a guy, you might like the bright pink/green look of a certain women’s shoe. Similarly, some girls prefer the no-nonsense style of men’s shoes. However, you’re generally better off sticking to shoes made for your specific gender. This is because men’s shoes are made to be slighter wider than women’s models. They also tend to be sized larger, because men’s and women’s shoe sizes are different. Sometimes men’s shoes come with a slightly thicker midsole/insole, because men generally weigh more than women. In saying this, it can be worth using shoes designed for the opposite gender in some situations. This is especially true if you’re a man with narrow feet or a woman with really wide feet. Just be sure to try the shoes on first (or get them from a seller that offers free returns) so that you’re sure they’ll fit nicely. What distinguishes tennis shoes from regular sneakers? Fundamentally, tennis shoes are designed for athletes. They’re supposed to be ultra-durable, meaning they’re capable of withstanding hours of incredibly intensive play without falling apart. Because tennis involves so many turns and short sprints, tennis shoes normally include a particularly grippy outsole. Plus, they’re normally made with a mesh upper for maximum breathability. Regular sneakers don’t usually have these features – they’re designed to just be stylish and comfortable enough for everyday use. However, they tend to be a little cheaper. Over the years, people have found that tennis shoes are great for other activities too! 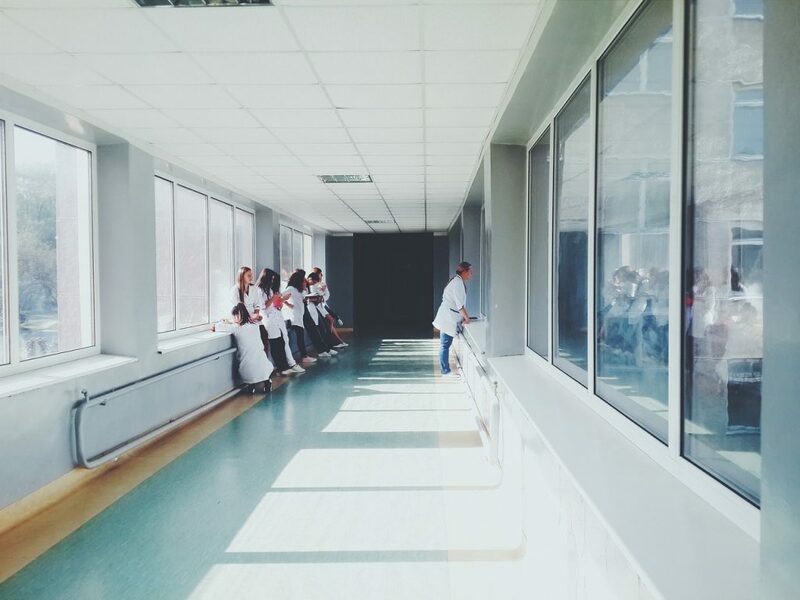 These days, they’re used by nurses, chefs, runners, and school students, among others. Using tennis shoes for stuff other than tennis is absolutely fine! In fact, it’s a great idea. Just be aware of what tennis players need that you most likely don’t. For example, you won’t be incredibly concerned about grip if you’re just buying some shoes for walking your dog. Prioritize durability, comfort, and cost instead of breathability and minimizing weight if you won’t be using your new tennis shoes for tennis. 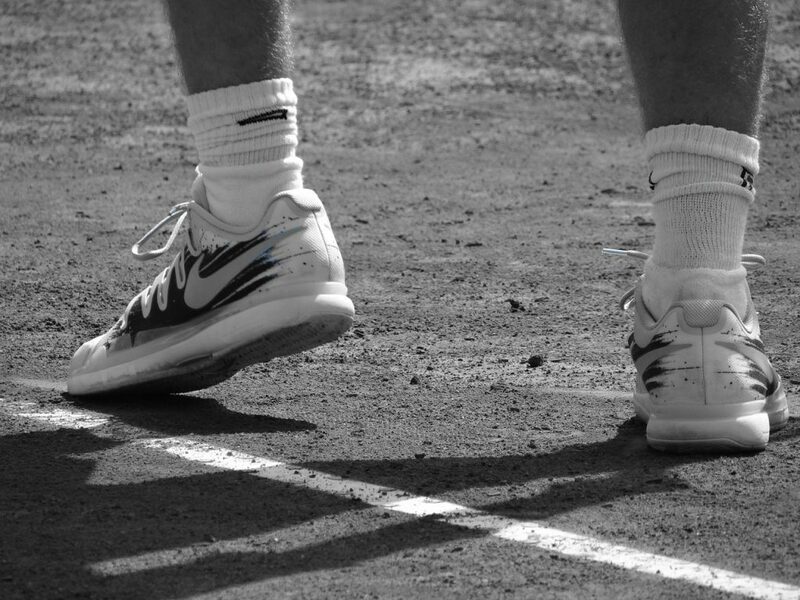 I’m a tennis player: what should I look for in a shoe? We’ve discussed using tennis shoes for everyday activities, but what about for actually playing tennis? Your number one concern is how comfortable the shoes are. If they rub against your feet and give you blisters, this is going to be a major distraction in-game and could really affect your performance. This is why it’s so important to find a shoe that’s the perfect size. Related to this is the shoe’s breathability, meaning how well it ventilates your feet when they get sweaty. 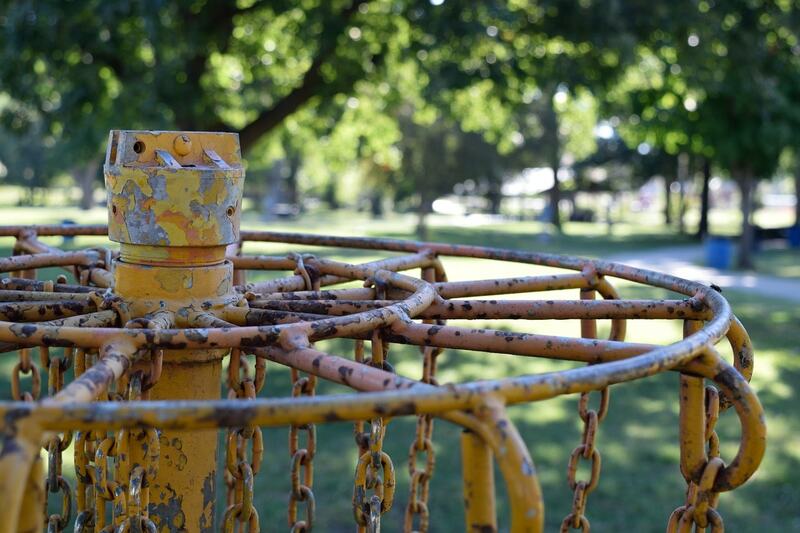 If you often play in hot, humid conditions, this is a particularly important consideration. Look for a mesh upper and a sweat-wicking internal lining when buying. 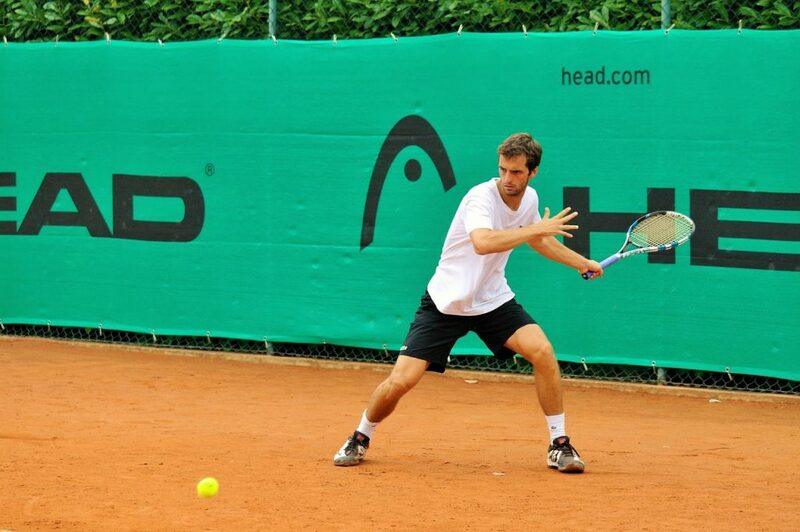 The insole and midsole should have plenty of padding, especially if you play on hard courts. Look for something that matches your arch type: if you’ve got particularly flat feet, choose a shoe that’ll provide the arch support you need to prevent overpronation. The outsole should be made of rubber and have good traction when stopping and turning. It should complement the insole and midsole in cushioning your foot when playing on hard surfaces. In addition, the outsole should be really tough – it’s often the first point of failure on a tennis shoe. Also consider the weight of your shoe. The lighter it is, the more nimble it’ll be, allowing you to get off the mark sooner. You’ll also want something with excellent lateral support to prevent you from rolling your ankle when turning. 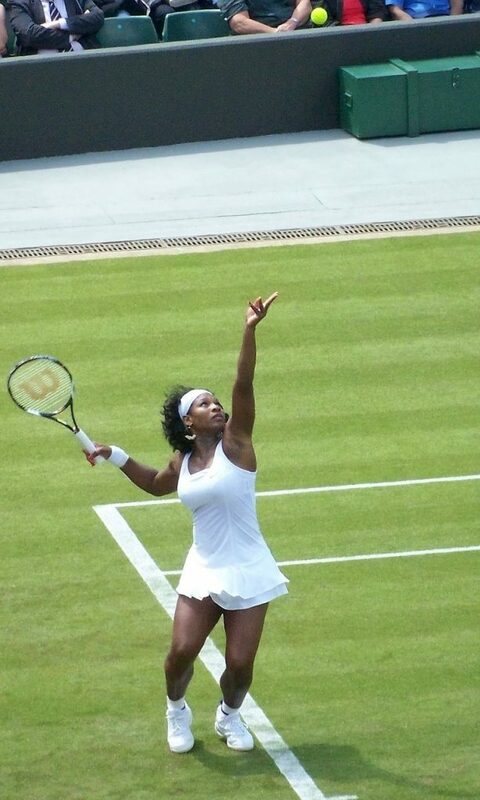 If playing on grass courts, look for something that’s light and nimble. Typically, play moves quite fast on these surfaces, so it’s worth prioritizing speed when buying. 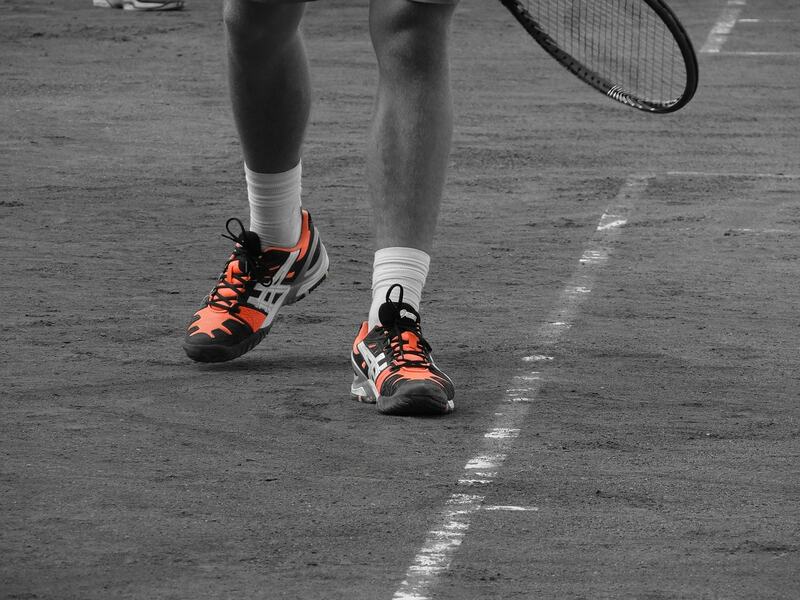 On clay courts, you’ll want shoes with an incredibly grippy outsole. Look for sneakers with fairly deep treads – this allows your shoe to dig into the soft ground a little easier. When playing on concrete/hard courts, you should try to find incredibly tough shoes. Since these hard surfaces are so unforgiving, it’s a good idea to have shoes with a tough rubber outsole. Unless the surface has been epoxied, grip won’t be much of an issue. Instead, choose shoes with a good amount of padding on the insole and midsole for shock absorption when landing. When choosing a tennis shoe, you should consider your arch height and how this affects your steps. Neutral pronators have a normal-looking footprint. Their arches aren’t particularly high, nor particularly low. Most typical Adidas/Nike shoes will work fine for you. Overpronators have a footprint that looks like the entire sole of your foot. This is because they typically have really flat feet. If you’re an overpronator, you’ll need shoes with excellent arch support to help reduce the load on the inside of your foot. Underpronators have a footprint that only shows the ball, toes, outside, and heel of your foot. They have particularly high arches, so arch support isn’t as important. Instead, underpronators need excellent midsole cushioning, as the heel and ball of their foot will be bearing the brunt of the force exerted as they walk. To determine which type of foot you have, you can perform the wet feet test. Simply wet your feet a little and walk on a blank sheet of paper to get an outline of your footprint. For overpronators, your best bet is an ASICS or New Balance shoe. These companies typically include better arch support in their products’ midsoles. 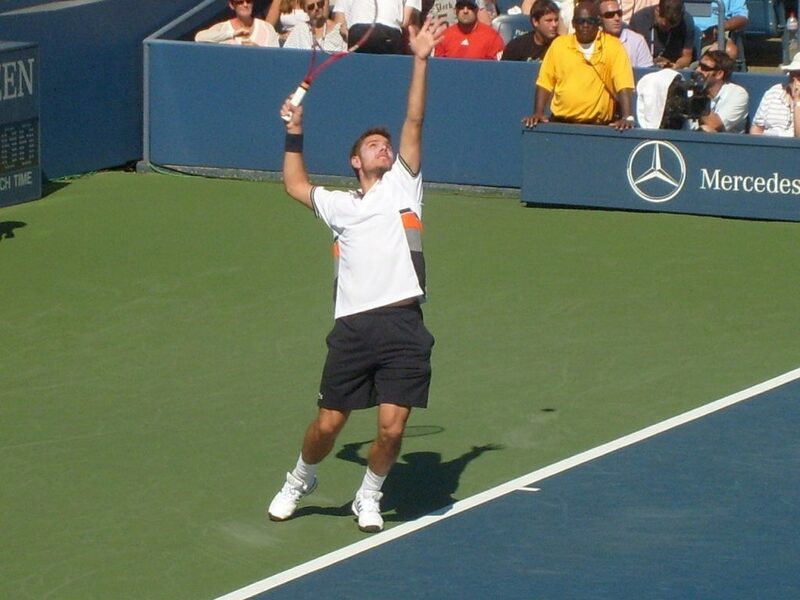 Some tennis players also have particularly wide feet. If you’re one of these people, New Balance and ASICS are also good options for you. They tend to make shoes in specialized wide sizes, while Adidas and Nike shoes normally run quite narrow. Generally, you can order tennis shoes in your regular shoe size. However, if you’re playing tennis in them, you’ll want your shoes to fit fairly snug, so consider going a half size down if you think it’s necessary. If your shoes are loose, your feet will move around inside them, which can cause blisters. If you don’t know your shoe size, check out this handy guide. When buying online, make sure to buy from a seller that offers free returns. This ensures that you don’t have to pay any postage costs if you don’t get the right size first time. What are the best tennis shoe brands? Wilson and Babolat have also been making tennis shoes for a while now. They’re both household names in the world of tennis, so their options are definitely worth checking out. If you’re looking for something that’ll last a really long time, stick with one of these aforementioned brands (more on this below). How much should I pay for a pair of tennis shoes? $150+ tennis shoes are by no means essential. While they may offer an extra edge for aspiring pros, you don’t need to spend this much if you’re a beginner player or just using your shoes for walking/running. Most of the best shoes out there (in terms of value for money) will cost you around $50-$120. Anything lower is beginning to stray into poor quality knockoff territory, while anything higher will begin to see diminishing returns on the additional investment. Just be aware that most $50-$60 models aren’t likey to last for more than 8-12 months, especially if you’re playing competitive tennis in them. It can be worth investing in a more expensive pair, as long as you can find something that’s really durable. We hope you found the right tennis shoes for your specific needs. If you have any questions at all, drop us a comment below for a response within 24 hours.